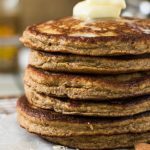 These Almond Butter Protein Pancakes are the perfect breakfast when fueling up for adventures, a long day of swimming, or a great workout. In a large bowl, combine oat flour*, baking powder, and cinnamon. Add in almond butter, mashed bananas, and eggs. Mix with a blender, just until well combined. Let batter sit for 10 minutes before using. Heat a skillet with a small amount of coconut oil over medium. Add 1/6 of the batter to a skillet, cook for 2-3 minutes on one side, flip and cook for about 2-3 minutes or until Cooked through. **If you do not have oat flour, you can make it by blending old fashioned oats until a flour consistency is achieved.